Buzzacott wins The Hedge Fund Journal Award. 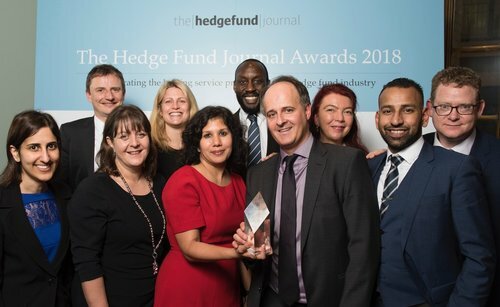 We are delighted to have received the award for 'Leading Accounting & Business Services Practice' at the annual Hedge Fund Journal Awards, which celebrate outstanding service contribution to the hedge fund industry. Our Corporate & Business Services team has developed a reputation for consistently providing the highest standard of service in the industry. Over the last 15 years, Buzzacott has supported hundreds of clients ranging from start-ups, established managers and US inbound funds. "Our broad service offering includes outsourced accounting, Annex IV reporting, FCA reporting, payroll, HR consultancy, company secretarial, taxation and HR consultancy services. This award recognises our continued success as being the market leader in this specialist field." This follows on from our previous success winning Leading UK Fund Manager Audit Practice at the Hedge Fund Journal Awards 2017. Over the last 10 years, the audit team's reputation has grown in this niche sector and is now considered to be a trusted alternative to the 'big four' as an audit team with specialist expertise providing the highest standard of service. Team Leader, Peter Chapman said of winning the award last year "This award is testament to the hard work put in by all members of the team over a number of years."